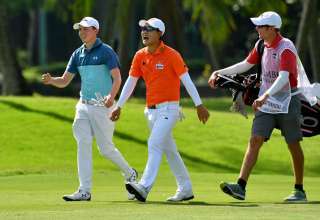 Young hotshot Phachara Khongwatmai of Thailand stumbled at the final hurdle on Friday morning and agonisingly missed a chance to leapfrog the Japanese duo of Hideto Tanihara and Satoshi Kodaira and Korea’s Kyungnam Kang into the lead after the completion of the first round of the SMBC Singapore Open. 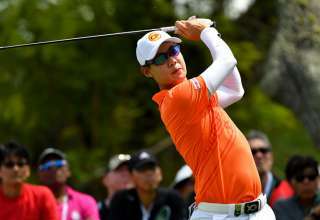 The 17 year old, whose star has been on the rise since 2014 when he became the youngest ever player to win a professional event at aged 14, returned to The Serapong Course at Sentosa Golf Club to finish off his round and back-to-back birdies on 16 and 17 tied him with the leaders. 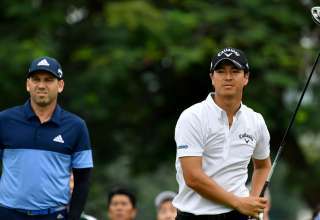 Phachara, however, bogeyed the 18th hole to fall into a tie for fourth place with fellow Thais Pavit Tangkamolprasert and Panuphol Pittayarat, Malaysia’s Gavin Green and Korean-born American Seungsu Han on five under 66. Panuphol also ended his first round on Friday morning and picked up a birdie on the ninth, his closing hole. 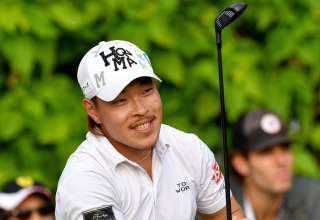 Tanihara, a multiple winner on the Japan Tour, and Kang set the early pace on Thursday with 65s and were joined at the top by Kodaira who shot three birdies in his closing four holes, in fading light, after a two and a half hour rain delay. 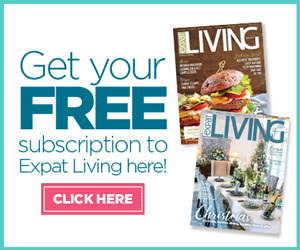 Tournament favourite Adam Scott of Australia overcame the horror of a triple bogey on his card on Thursday to shoot three under 68 and lie just three shots off the pace in an event he has won three times. The world number seven birdied the 17th on his return to the course on Friday morning. Defending champion Younghan Song of Korea, playing alongside Scott, also carded a 68 thanks to a birdie on the 18th. South Africa’s Ernie Els, twice a runner-up in the Singapore Open, is in danger of missing the cut after signing for a two over 73. The US$1 million SMBC Singapore Open is co-sanctioned by the Asian Tour and the Japan Golf Tour.